Goring Cricket Club sealed their survival in Sussex League Division 3 while ending local rivals Findon’s slim promotion hopes on Saturday. Goring won by 29 runs after declaring on 246-8 and then bowling Findon out for 217 as they recorded a third successive win. After winning the toss, Goring elected to bat and their total was built on 91 not out from Dan Pittham, who struck 14 fours and one six from 95 balls. Ellis Woolley also added 33 and Anir Guha hit 25 as Alex Norman, Alexander Copeland and Sam Dunkley all took two wickets for Findon. Matt Keen dismissed Bradley Bridson (nought), John Rogers (seven) and Glen Bridson (nought) early in Findon’s reply as they fell to 9-3. 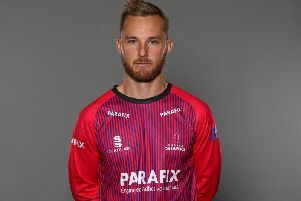 Mark Solway and Alex Nielsen then put on 131 for the fourth wicket, before Nielsen fell for 69 from 51 balls after striking eight fours and four sixes. Solway’s dismissal for 81 left Findon 190-6 and despite 22 from Sam Mannings and 16 from Dunkley, Findon were all out for 217 in 44.1 overs. Keen finished with 5-74 from 17 overs and left-arm spinner Aaron Wyatt picked up 4-72. Goring vice-captain Ross Baumann was delighted as his side sealed their Division 3 safety and said: “You always want to win games against your rivals and it was a really good performance from us. “We performed well on the day and deserved the victory. It’s nice we’ve been able to secure our safety with a game to spare. “We’ll go into our final game with the pressure off and hopefully we will be able to put in a good performance. Findon skipper Bradley Bridson said: “Results went our way in the other games but we just didn’t get going. “If we had won, we could have been only ten or 12 points off the top two but they recovered from 147-6 to score 246-8 and that was probably the key point in the game. “Dan Pittham batted very well and didn’t give us a sniff, while Ellis Woolley was a bit shaky early in his innings but then batted really well. “They were really up for it and I don’t know what it was but we just seemed a bit lackadaisical. We were missing a few players but they played well and had their full-strength team out, apart from Alex Maynard, and Matt Keen made a massive difference for them. “Our poor start with the bat didn’t help. If one of John, Glen or I had got even just 30 or 40, that might have been enough. Or if we’d batted our overs, we’d have probably won so it was really disappointing. Findon finish their season away to Portslade on Saturday, while Goring entertain Steyning.